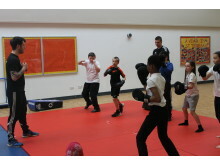 ng homes has teamed up with the NHS, AXIS Health Hubs and Active Schools to produce a unique health and fitness pilot project for P6 and P7 pupils in Saracen Primary School in the north of Glasgow. 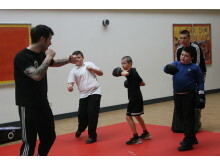 This innovative programme has been designed to match the experiences and outcomes within the Health and Wellbeing and Science areas of Curriculum for Excellence and is compliant with the Health Promoting Schools Scotland Act 2007.It aims to encourage, support and help sustain the children and their families in making healthy lifestyle choices, focussing on exercise and diet. The ten-week course ran from January to March, with the physical and sporting aspects of the programme taking place on 2 days each week. Over the course of the programme the children were exposed to 14 different indoor and outdoor activities, conducted by fully qualified, specialist staff. 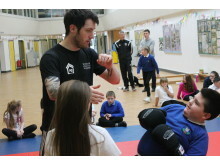 The variety of activities caters for all pupils, including those with additional support needs and pupils who are normally reluctant to engage in physical activity. The careful planning of the project was undertaken by teaching staff in consultation with those partners identified above and throughout the programme those partners met regularly to evaluate and amend the programme where necessary. Initial benchmark data was collected and will serve as a useful tool in measuring progress upon completion of the programme. The involvement of parents and carers was a crucial component of the programme so that lessons learned in school could be reinforced at home and to that end a 6 week healthy cooking course for parents was implemented. Not only did this encourage parents and carers to come together in a social setting, while learning how to cook simple, affordable and healthy meals, but the pupils worked alongside them, learning important skills and finally sharing a dining experience together. Midway through the programme all the indications are that it has exceeded the expectations of all those involved.. 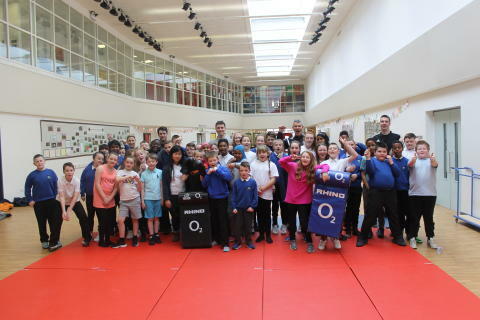 In particular, the response from classroom teachers and pupils has been excellent with reports that all the children have become engaged with the activities andhave made real progress in terms of their physical activity profile, with additional improvements being evident in attendance, punctuality, involvement in after school clubs and in motivation. The pupils continue to make small but significant changes to their diet. Each pupil logs their progress on a daily basis, using an ‘Active Choices Diary’. Enthusiasm for the programme has extended beyond the 2 classes directly involved and encompasses the entire schoolpopulation. Being twinned with a Jamaican Primary School has enabled this, with all classes engaging in daily walking, skipping or running activities, recording the distances they cover to match the distance from Scotland to Jamaica. This “Jog To Jamaica” component of the programme has heightened the competitive nature of staff as well as pupils. The knowledge gathered by the pupils has resulted in them persuading Evelyn Gibson, head teacher, to make some changes to the school policies on Drinks and on Footwear. P7 pupils are now working with the head teacher to implement change in light of their newfound knowledge. Dominic Henry and Karen Kinghorn, the class teachers, have fully embraced the project and are challenging their pupils every day to make better choices.We recently celebrated the outstanding success of the Saracen Primary P7 netball team at a recent interschool competition, when the children won 13 of their 14 matches. More recently Primary 7 were involved in the inter-school athletics programme at the Emirates Arena and once again did very well there. All partners in the programme are now very confident that an effective model is being developed which could be replicated in other schools within the north of the city. Evelyn Gibson, who monitors the progress of the programme closely, said, ”I am so proud of the way my entire staff has embraced this Happy, Healthy Hearts project and the benefits to the pupils are evident and measurable. Working in partnership with dedicated and committed sports and health professionals has made a significant difference to the overall provision of the programme, including the crucial parental component. The increased levels of confidence among the children, has led to them implementing policy change within the school. 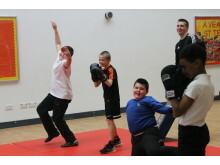 I feel this has been a fine example of raising attainment through sport and we hope that this will result in a lasting legacy of healthy lifestyle options”. Chairperson of ng homes John Fury said: “We are delighted with the progress of the Happy Healthy Hearts programme. Encouraging children at a young age to keep active and make the right choices about their diet and fitness will stand them in good stead as they get older. “It’s also very encouraging that parents and carers are also involved in the project and support the whole approach around Active and Healthy families in the household.